It is now solidly mid-December and I’m still doing my 3-mile (each way) commute by bicycle. I started biking to work for this season around the beginning of April and purchased a dedicated commuting bike on April 21st. Since then I’ve logged 770 miles commuting just about every day; rain, snow, or shine. 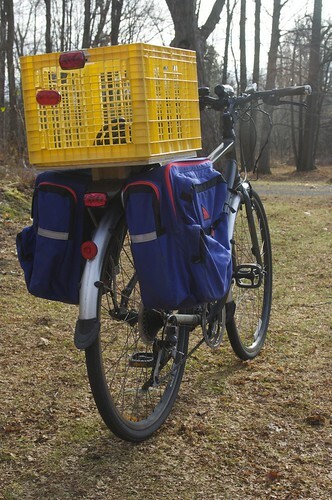 The commuter bike, a Giant “Tran Send”, has received some accoutrements over the course of the year: storage, improved lights, and winter rubber. The panniers I had purchased in April ended up being returned since they were too small to fit my laptop and gi. In their stead was a plastic crate lashed to the rack with zip-ties. 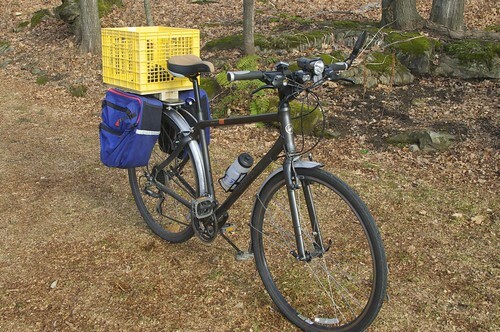 The crate wobbled a bit when piled high, but sufficed for most of the summer until I had the chance to augment it with some old panniers that had been stored in my parents garage since a Boyscout bike-hike many years ago. 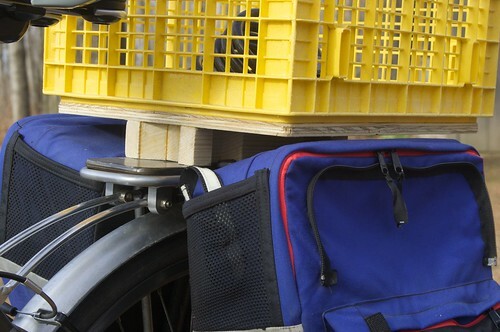 The old panniers didn’t fit the laptop either, so to fit both them and the crate I fashioned a wooden riser-platform to allow the crate to sit a few inches off the rack. While difficult to attach, this arrangement has the benefit of enhancing that stability of the crate as well as providing as much storage as I care to fill. 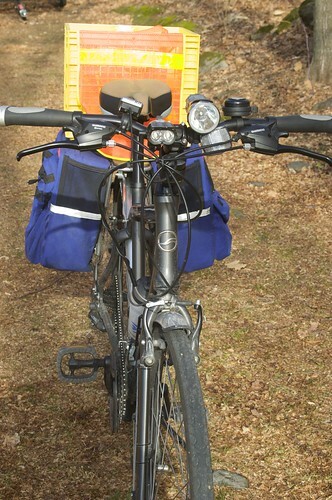 The second upgrade was the addition of several more blinking tail lights and the CygoLight Mity-Cross headlight that I had purchased for the 24 Hours of Great Glen mountain bike race. A reflective vest also joins the lights for what I’m hoping will provoke a reaction along the lines of, “Is that a Christmas tree ahead?”. Last week brought the latest update, studded snow tires. 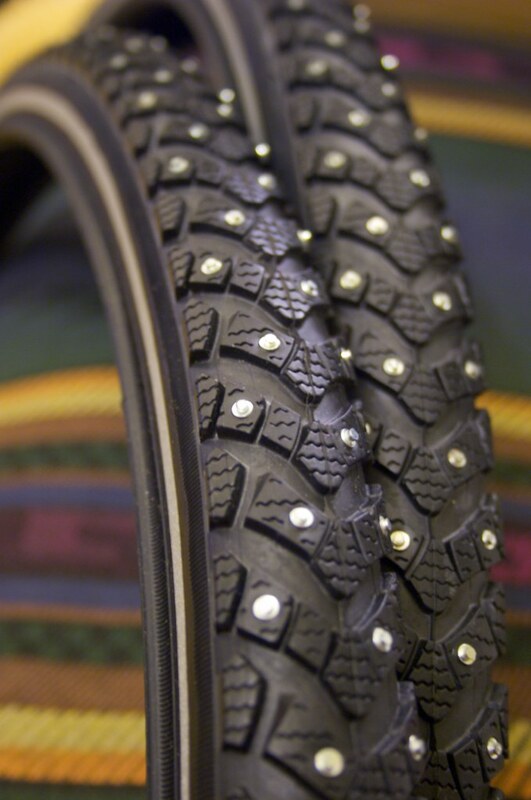 I purchased the Schwalbe “Marathon Winter” tires from Peter White Cycles in New Hampshire (mail order), with 240 tungsten-carbide studs in each tire. At this point they’ve only seen a bit of snow and ice, but they remove the hesitation I built up after a tense, snowy commute with my slick summer tires. 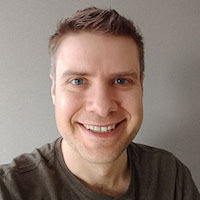 Now that winter seems to have started for real, my plan is to bike as much as I feel comfortable with and car-pool with Sarah or take the bus if the weather is bad. I’d like to push myself a bit to continue through the winter, but would rather not take any risks of being hit by drivers who might be sliding around the highway in a storm. Good for you! Looks like a good, solid commuter bike. Right on you have tungsten carbide studs in your tires!! My wedding band from Tungsten World is made of the same material! By buddy bent his gold ring on a ride recently…mine still looks good as new! !